The author of the popular blog Not Eating Out in New York chronicles her 2-year experiment to eat only home-cooked food. In addition to cooking at home, she explores other eating alternatives like supper clubs, trash diving, and urban foraging. As you might expect, recipes are included. Because it’s about changes she made in her lifestyle, it also chronicles parts of her personal life – primarily romantic relationships and family – but those are minor sub-plots in the otherwise food-focused narrative. At a little over 300 pages there is a lot packed into her book, but I still wanted more. First of all, I’m always curious about how people who cook a lot handle the day to day aspects of planning, shopping and fitting this all into their schedules (though Erway was pretty forward about cooking being her main hobby). Secondly, I wanted to know what sorts of things she cooked on evenings when she was in a rush and made something simple and quick before or after her evening plans. This is part of what I find so difficult about not eating out – coming up with something quickly when I’m hungry and standing in my pantry staring at a hodgepodge of random ingredients. But this isn’t a how-to manual, nor was it written with my particular culinary questions in mind so I’ll forgive her for not including much on these subjects. I clearly don’t have the innate creativity and love of cooking that made Erway’s experiment so successful. 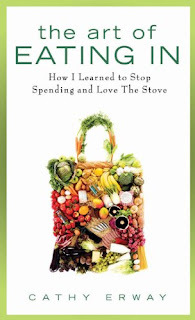 But her point was taken – eating home cooked food is cheaper, healthier, in many cases tastier, and less trash-producing than a diet of fast-food, take-out and restaurant food. Though it would be extremely difficult for most people to even come close to what Cathy Erway did, most of us could certainly benefit from cooking more at home, and her book is an entertaining and inspiring starting point. One thing I often is keep around stuff such as pasta, pesto and cheese, mushrooms, bottled pasta sauce, eggs, and frozen sausage (often veggie). I also find black beans and rice mixed w. sauteed onions and garlic (lots of garlic) makes a yummy meal. It doesn't help much with the issue of getting more green vegetables in your diet, but the habits listed above have provided me ways to get 3 or 4 different meals out of stuff that's already in the house when I get home at night.